The design is characterized by the falling shoulder line of the Bugatti Type 57 C Atalante and the perfectly balanced proportions of the Type 41 Royale. Purist, flowing surfaces and lines create a perfect equilibrium between elegance and sportiness. The central model in the new series is the PJ63 Niniette, with a length of 63 feet (almost 20 meters) and a beam of 20.3ft (6.2 meters). This yacht features a 63 m2 salon on deck, a 43 m2 salon below deck, luxurious accommodation for up to 4 guests and a crew cabin. On request, Bugatti can tailor the interior to meet customers’ individual requirements. 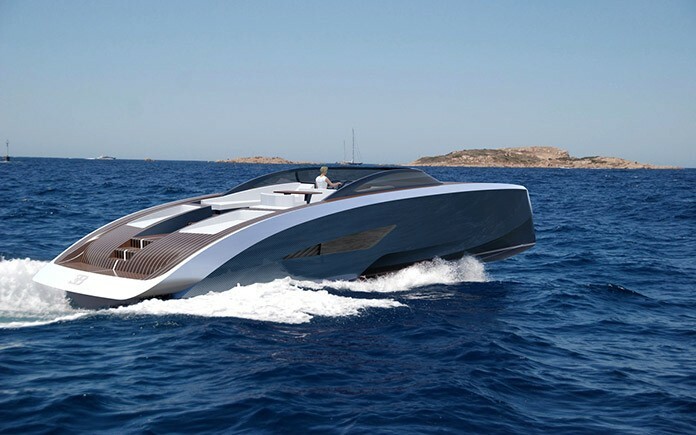 The PJ63 Niniette has a basic price of about €3.25 million. From the wooden boats built by Palmer Johnson at the beginning of its history through later sailing yachts that won many major championship races to the groundbreaking design of sports yachts in the past decade and the company’s revolutionary SuperSport series, Palmer Johnson’s brand attributes have always been design, performance and emotional attraction. Founded in 1918 with its current headquarters in Moncao, Palmer Johnson has become a yacht building pioneer. 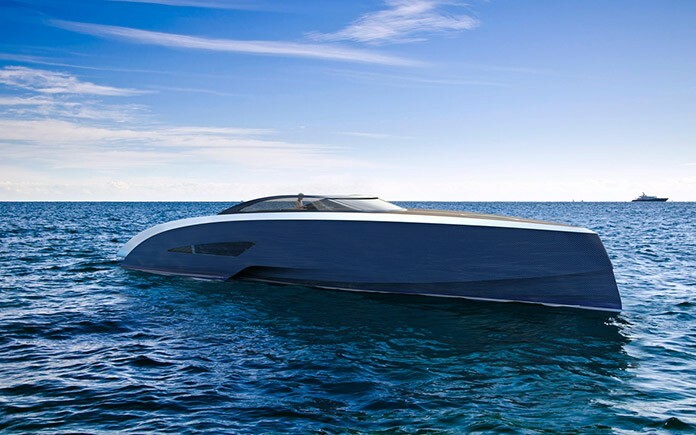 After breaking new ground in aluminum shipbuilding, the luxury yacht maker built the first hull entirely made from carbon fiber and the world’s largest carbon fiber motor yacht that resets the benchmarks in Superyacht performance and design. Like Bugatti, the Palmer Johnson name also stands for ultimate performance. Fortuna, built in 1979 for the King of Spain, was the world’s fastest yacht for a decade. Turmoil, the first expeditionary yacht of its type, has travelled around the world three times. La Baronessa is the largest aluminum yacht ever built in the USA. 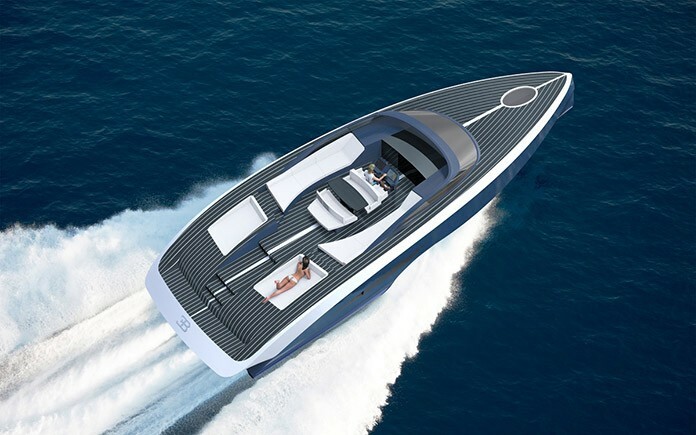 The latest aluminum sports yachts and the new generation of carbon fiber SuperSport yachts combine design with highly advanced technology and have established the image of modern yachts on the oceans of the world. Bugatti is the brand of a family of artists who distinguished themselves in an environment where other automotive brands were operated by entrepreneurs with a purely technical background. The company founder Ettore Bugatti, born and raised in Milan, Italy, succeeded in uniting this artistic approach with his technical innovations, thus creating the foundation of a design language that was to mould the Bugatti marque. The result has been a series of vehicles far ahead of their time, and which are today numbered amongst the most valuable classic cars in the world. The brand’s central philosophy of “Art, Forme, Technique” is a description of its mystique. Still based where the brand was founded more than 100 years ago, in Molsheim (Alsace, France), Bugatti today is an ingenious combination of the artistic roots of its Italian founders, the distinctive understanding of the French for exclusive luxury products and brands as well as the internationally acknowledged German engineering and technological leadership. Bugatti opened a new chapter of its successful future at the start of this century with the Veyron 16.4. The Veyron is the most powerful and fastest production sports car in the world and is unmatched in terms of performance, unique hand-crafted manufacturing and exclusive equipment with the highest degree of individualisation options. All 450 vehicles have been sold. So far no other car manufacturer has managed to successfully market a product that stands for unrivalled technical performance and pure luxury at comparable volume and prices. Currently Bugatti is working on its next super sports car which will be called Chiron and celebrate its world premiere at the Geneva International Motor Show 2016.